We have partnered together with Baby Einstein today to share this fun handprint and footprint baby art project with you. I was compensated for this post and all opinions expressed are my own. Having babies participate in arts and crafts time on a regular basis is a great way for them to infuse discovery, exploration and creativity as they grow. 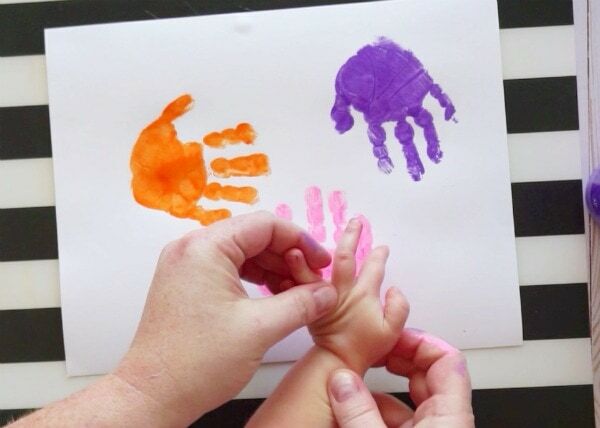 This handprint and footprint baby art project we are sharing today is a great example of how babies can enjoy exploring and discovering through art. Our handprint and footprint baby art project was inspired by Baby Einstein’s 5-in-1 Journey of Discovery Gym™. It is packed with discovery-inspired fun and features that will grow with your child as they continue to grow. Creating art regularly with babies and toddlers is another fun way to encourage learning and creativity as children grow. 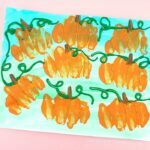 The best way to introduce art to babies is with simple and fun crafts and art projects that allow babies to explore different textures and to use their fingers and hands to strengthen fine motor muscles and hand and eye coordination. This ocean art project we are sharing today infuses several different sensory and texture experiences for babies. First with feeling paint on their hands and feet and then discovering their handprint and footprint on paper. 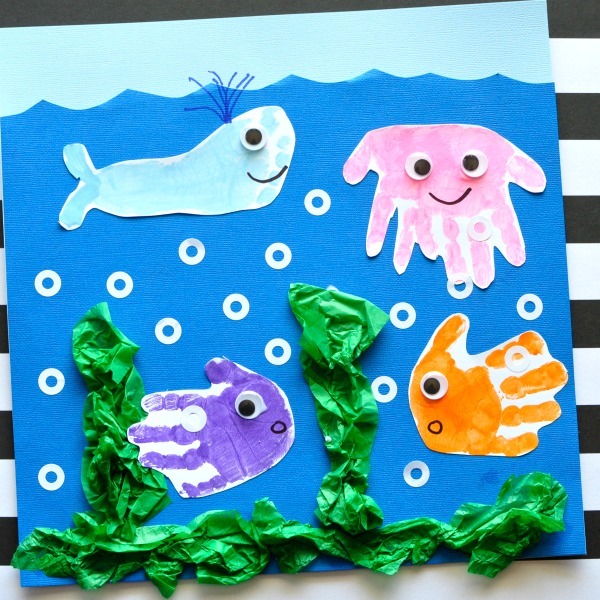 Next with exploring the sound of crinkling up tissue paper to make ocean plants. 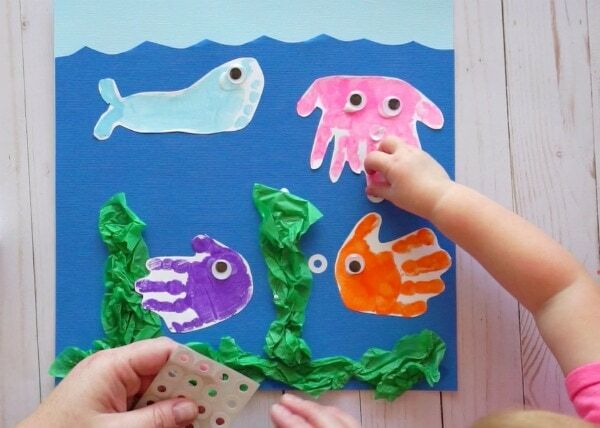 Finally, babies get the chance to be creative and work on hand and eye coordination as they place googly eyes and bubbles on their ocean art project. As with all the projects we share on our website, babies and children should always be supervised when working on arts and crafts projects. 1. Gather your supplies. Paint the inside of your baby’s hand. Press it down on the white cardstock to print the handprint. Grab a wipe and quickly wipe the paint off your baby’s hand. 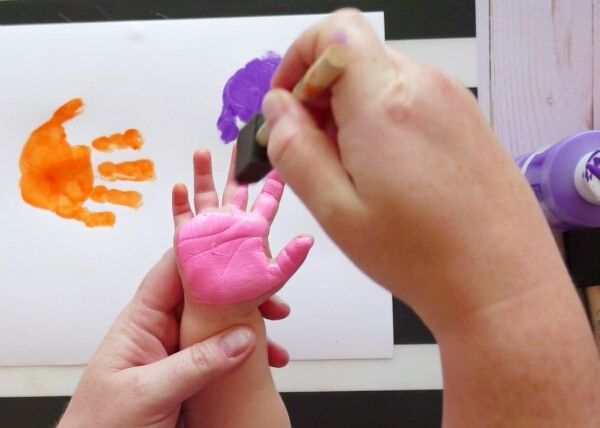 Paint your baby’s hand two more times with different colors and print the handprints on the white cardstock. Wipe your baby’s hand clean after each print. 2. Choose which handprint you would like to be your octopus. Using the opposite hand that you originally printed, paint the thumb, index, and middle finger with the same color and part of the palm. 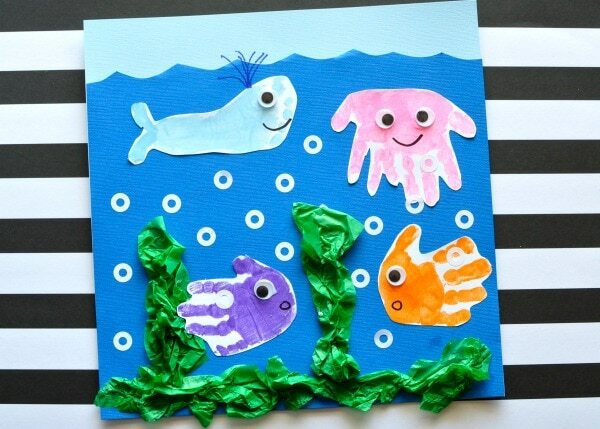 Print this onto the existing handprint so your octopus has 8 legs. 3. To make a whale, paint one of your baby’s footprints with light blue paint. Print it onto your white cardstock. Use the paintbrush to paint tail fins at the bottom of the footprint. 4. While the handprints and footprint dry, cut off a small section on the top of your blue cardstock to look like ocean waves. Glue this piece onto your light blue cardstock. 5. Cut out a few strips of green tissue paper. 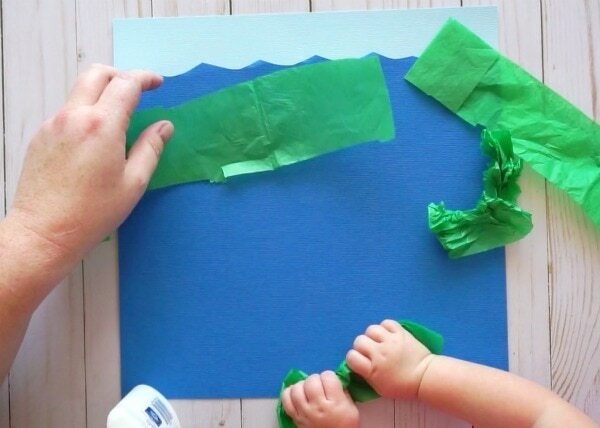 Show your baby how to crinkle up the tissue paper and help them glue it onto the bottom of the blue cardstock for ocean plants. 6. Cut out your handprints and footprint and glue them onto your blue cardstock. Make sure to glue the whale towards the top of the ocean. 7. 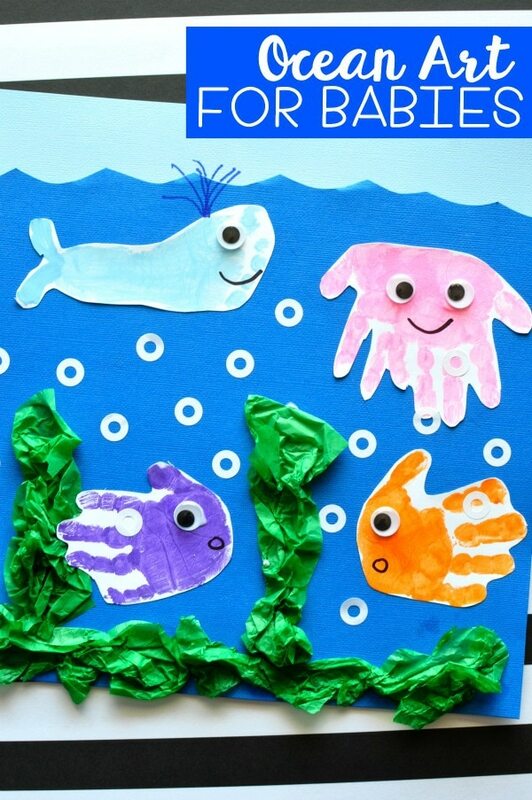 Add dots of glue onto the fish, octopus and whale for your baby to place googly eyes onto the ocean animals. 8. 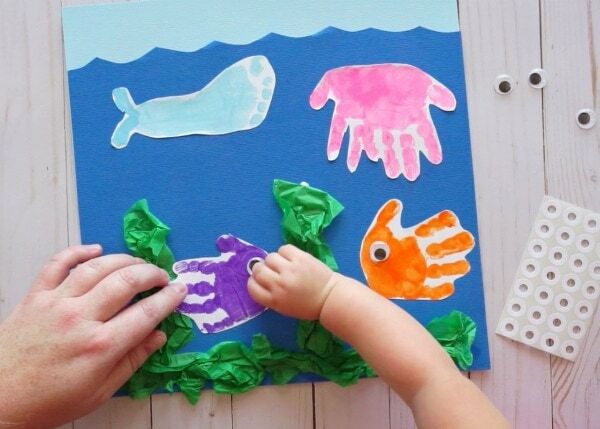 Finish the ocean baby art project by letting your baby add binder hole reinforcement stickers all over the project for fish bubbles. Your handprint and footprint baby art project is finished! Make sure to subscribe to Baby Einstein on You Tube where you can see a video tutorial of how to make this handprint and footprint baby art project. You will also find engaging videos for your little ones to watch. 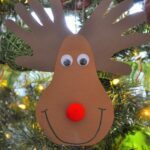 Looking for more simple baby and toddler arts and crafts? 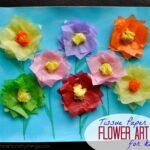 Using cupcake liners for crafting is great for babies and toddlers. Try using them to make this fun ice cream cone craft. You might also love this simple paper plate sun craft.